Co-operators from across Canada will be gathering in Edmonton from June 26-28 for the joint Congress of the Canadian Co-operative Association (CCA) and the Conseil canadien de la coopération et de la mutualité (CCCM). The Congress, held in co-operation with the Alberta Community and Co-operative Association (ACCA) and the Conseil de développement économique de l'Alberta (CDÉA), will take place at the Westin Edmonton. It will include a welcome reception, speakers, panels, a gala awards dinner, a silent auction and the Annual General Meetings of CCA, CCCM and ACCA. 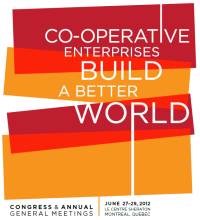 The theme of the Congress is Sharing our successes; Building the future, and part of the programming will focus on the Blueprint for a Co-operative Decade, a strategy document created by the International Co-operative Alliance (ICA) aimed at making co-ops the fastest-growing business model by the year 2020.